What you consider to be your most important human right appears to depend largely on where you live, according to a new survey by YouGov . The polling organization questioned people from seven European counties and the United States on 30 human rights that appear in declarations from the United Nations, European Council and the American Bill of Rights. It also included rights that have featured prominently in recent debate in the media. Respondents were asked to choose up to 10 of the 30 rights that they considered the most important. These charts from i100 show the percentage of respondents from each country that voted for each right. 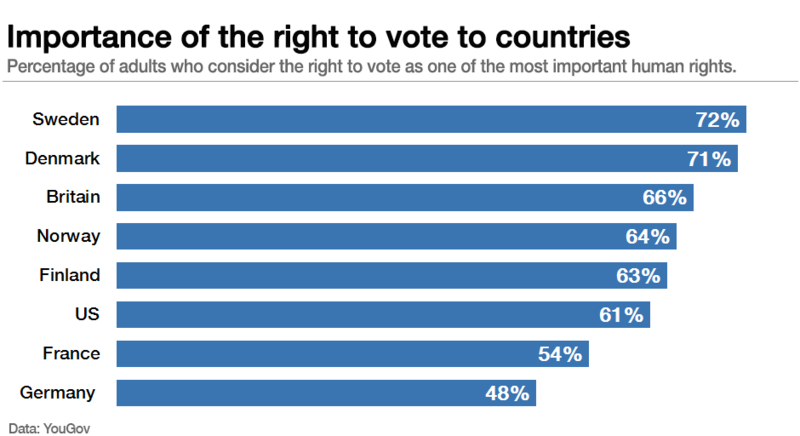 The freedom to vote was ranked as the most important human right in five of the eight countries. The United States values free speech as the most important human right, with the right to vote coming in third. Free speech is also highly valued in Germany: its citizens also see this as most important. In all eight countries, more than 50% of respondents selected free speech as one of the most important rights – it was the only right to receive 50% or more votes from all countries. 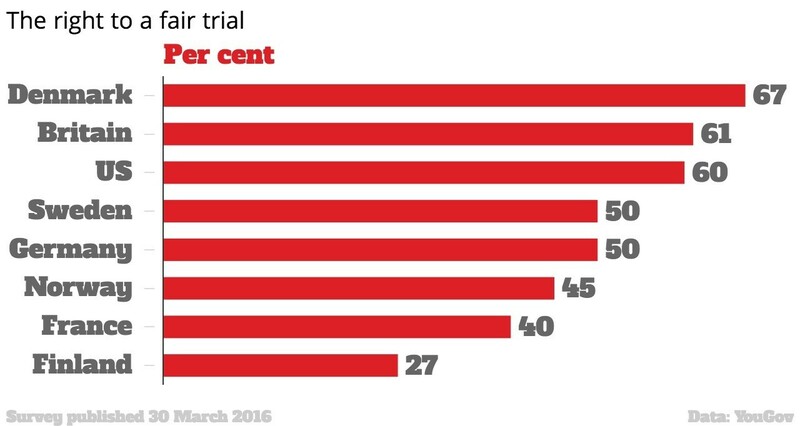 The right to a fair trial, too, is considered by people in half of the countries to be one of the top five most important. In Britain it was voted the second most important, and in the US, Germany and Denmark it came fourth. The right to free school education and low-cost healthcare are considered a priority by most countries. However, France and the US valued these rights less than other nations. A difference in history and culture, especially with regard to public service provision, could explain the variation between the US and the majority of European countries. The US also differs from the European countries over the freedom to pursue a religion of choice, a right ranked important by 53% of Americans, but considered important by less than 30% of people in most other countries. Life for an unborn child is another right that Americans value much more highly than Europeans, with 30% of US citizens naming this as one of the most important rights, whereas in most European countries less than 10% of people consider it a priority. 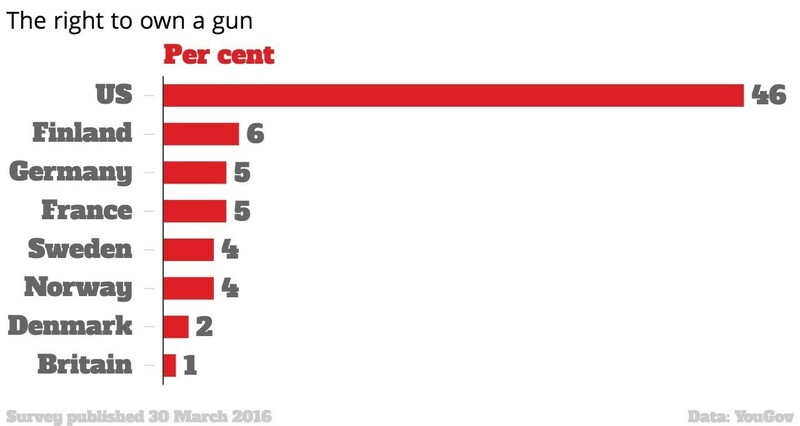 Another area where Americans and Europeans hold very different views is the right to own a gun. Almost half of US respondents viewed their freedom to own a gun as an important human right, whereas fewer than 6% of citizens in European countries have gun ownership at the top of their list. The rights ranked as some of the least important by all eight countries include the right to fight elections without spending limits, the right to operate a company with few regulations, and the right to live in an area without many immigrants. Have you read? What is the World Humanitarian Summit? 10 things to know about human rights Are your human rights in jeopardy?